Amazon.com description: Product Description: The Formation of Vegetable Mould Through the Action of Worms-With Observations on Their Habits is a classic biology essay by Charles Darwin. From his brain-storming about transmutation towards the end of 1838, Darwin conceived of his theory of natural selection "by which to work", as his "prime hobby". His main work on the Beagle collections continued, and in 1842 he published the first of three volumes on geology, The Structure and Distribution of Coral Reefs. He then allowed himself to write out the first "pencil sketch" of his theory. Subsequently, in September 1842, the family moved to rural Down House where he had space for experimental plant and animal breeding, and surroundings to observe nature. In December of that year he had a quantity of broken chalk spread over a part of a long established pasture field near the house, "for the sake of observing at some future period to what depth it would become buried." In 1872 he was having disagreements with St George Mivart about The Descent of Man. Darwin cut communication with Mivart and went the less controversial direction of the lowly worm. His network of correspondents and fans responded to his interest and "earthworm anecdotes began surfacing in his mountain of mail". He had been interested in earthworms "since his first fishing days at The Mount and flirting days at Maer". Still, other work constrained him. Broken off from Descent, he had to finish his next work The Expression of the Emotions in Man and Animals. By 1876, with his first grandson on the way, he felt his writing life was nearly over, with so much unfinished. He wanted to write on earthworms "before joining them", but also had two more plant books in mind, and a revision of Fertilisation of Orchids to work on. He also began an autobiographical work intended for his family's eyes only. After turning away a request to support a controversial book on contraception (Fruits of Philosophy) â Darwin was opposed to it â he got back to work on flowers and worms. As with much of his geological and evolutionary work, worms were a case of gradual, barely noticeable changes accumulating over time into large effects. He even went on a two-hour excursion to Stonehenge to see how its monoliths had been buried by earthworm castings. He was occupied by worms at Downe in 1880, his work coming first. He had help from the family, even receiving soil samples from Abinger's Roman ruins. He told Vladimir Kovalevsky (his Russian translator) of slow progress with his new book. Earthworms mate in daylight, but are generally nocturnal above ground. Darwin calculated that there were 53,767 earthworms recycling away per acre. He carried out experiments indoors, where they worked the earth inside pots in a worm-littered room. He experimented with stimuli at night: strong light would send them into their burrows ("like a rabbit" said Darwin's grandson Bernard), but heat and sound had no effect. Their food preferences were also tested, raw carrots being their favourite. Darwin was fascinated by their behaviour, from enjoying "the pleasure of eating" (based on their eagerness for certain foods) to their sexual passions, "strong enough to overcome... their dread of light", even to their social feelings ("crawling over each other's bodies"). Their foraging was especially intriguing: they dragged leaves into their burrows, pulling them in the most efficient way, by their pointed end. On these semi-intelligent creatures Darwin wrote that they obtained a "notion, however rude, of the shape of an object", perhaps by feeling it out. Worms, "five or six feet" below the ground ploughed farmers fields. Darwin felt we "ought to be grateful" to these little recyclers, which he compared to "a man... born blind and deaf". He was wondering how long it would be until he would be consumed by worms himself. 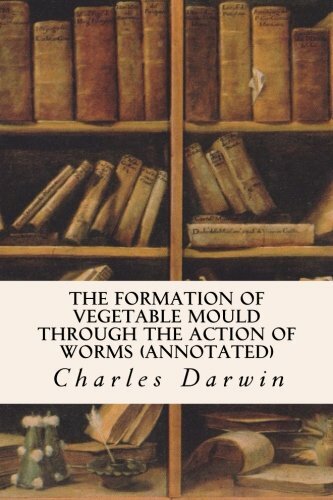 It would surely be his last major work; he told German translator Victor Carus "I have little strength & feel very old"
About: The Formation of Vegetable Mould Through the Action of Worms-With Observations on Their Habits is a classic biology essay by Charles Darwin.